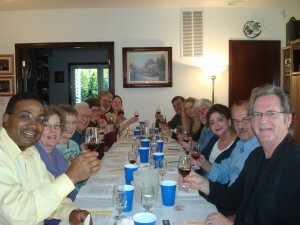 Wine and Beermakers getting together to share their passion. The wine for tasting this month was Barbera. Barbera originates and is grown extensively in the Piedmont region of Italy. It is the 2nd most grown grape in Italy after Sangiovese. Barbera is far more versatile at the dinner table than the more well know big reds and much less expensive. It is a very food friendly wine Barbera is a red wine, medium to heavy body, lots of berry aromas, with a ruby red color, very low levels of tannins and high acidity. It used in blending with the Nebbiolo grape in Barolo and Barberesco.